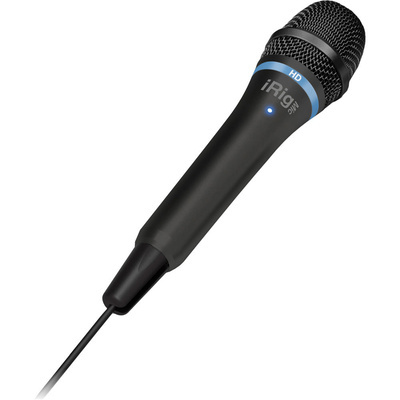 Product #18090 | SKU IP-IRIG-MICHD-IN | 0.0 (no ratings yet) Thanks for your rating! The IK Multimedia iRig HD Handheld Digital Condenser Microphone for OS X and iOS is designed for direct digital audio recording to a Mac and iOS devices. The microphone features a condenser-electret cardioid capsule with a built-in windscreen connected to a preamp and 24-bit 44.1/96 kHz A/D converter within a durable metal housing. An LED indicator light shows status and audio level. It can be used handheld or placed on a microphone stand. The microphone provides a frequency response of 40 to 18,000 Hz with three gain settings and a maximum SPL of 134 dB. The unit comes with a protective vinyl carrying bag, a microphone clip, a 5/8" to 3/8" thread adapter, a lightning cable for connecting to current generation iOS devices, and a USB cable for connecting to a Mac. A 30-pin cable for connecting to older iOS devices is available sold separately.